Construction Update as of 9/21/18: This project was substantially complete by September 21, 2018. Full rebuild of the road from Meridian Road to NE 6th with new curb, gutter, and detached sidewalk. Rebuild and widen the bridge over Five Mile Creek. 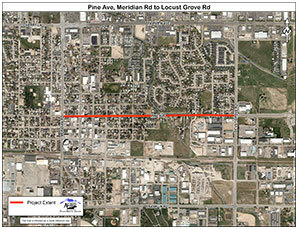 Widen Pine Avenue to 3 lanes. Full rebuild of the road between the bridge over Five Mile Creek and Adkins Avenue. Connect new sidewalk to existing sidewalk east of Adkins Avenue. Pine Avenue, Meridian Rd. to 3rd St.
Pine Avenue, 3rd St. to 6th St.
Pine Avenue, Five Mile Creek to Locust Grove Rd.